I met a man for coffee this morning. The man happened to be my husband of nearly eleven years. We took the small Bears to school and then had to meet to sign papers for a refinance of our mortgage. We are going to pay off the mortgage in 15 years instead of 30. If all goes as planned, we'll own our home by the time the GB is ready for college. The Bear needed to travel to a different worksite for the afternoon. He had time to kill before meeting some coworkers to carpool with them. We decided to get coffee together. We just went to Starbucks, it's the easiest option these days. This particular Starbucks is brand new, having been built only this past fall. It's right down the street from our house and we've enjoyed having one so close to home. There are murals on the walls and fake-old tables and lots of magazines and newspapers lying around. It makes us miss the funky coffeehouses of our youth. We can't find too many of those anymore. He had a grande bold, black. I had a tall skinny latte with Splenda and a little vanilla sugar. We have divergent tastes in coffee. I talked his ear off while he logged into his email and made notes to take to his meeting later on. It wasn't the most romantic date. But we enjoyed having 45 minutes alone in the middle of the day. That doesn't happen to us very often. We talked about our small Bears, our weekend plans and our pride in our financial stability. I told him I would be making pork chops for dinner. I took pictures as I often do. He laughs but I take pictures most places I go. I even took some pictures of him. We parted ways. I went to pick up the small Bears, by way of the grocery store. He headed to the carpool meeting area. We kissed goodbye in front of Starbucks. My heart felt skippy-jumpy while I waved him off. He still makes me feel like the twenty-year-old girl who met him at a college party, before mortgages, children and overpriced lattes. I'm always looking for ways to make dinner exciting. I go through phases with dinner; I enjoy cooking and I always plan my dinners for the week and shop accordingly for ingredients, so I am prepared every night. But I get bored. Every couple of months I start looking for new ideas and recipes to incorporate into my repertoire. Stuffed peppers are one of those dishes that I keep trying to get right. This is a dish I had tried to make numerous times in the past and was always sort of okay with it but never very excited about it. I was determined to try again and made them recently with some modifications to my old recipe. I was very happy with the way they turned out! The Bears loved them too. They are definitely going into the rotation for good. They're healthy and they combine simple, inexpensive ingredients in an interesting way. My recipe includes some meat (ground turkey breast) but I think this would be delicious made meatless as well; you could use tofu or chopped mushrooms in the rice filling. This recipe is based on the one in my Betty Crocker cookbook but I have made some modifications which I think taste better and work better too. Start preparing the bell peppers. You could use any color but I went with green because they're the least expensive and because they were the biggest ones at the store; all the better for stuffing. Look for bell peppers that are sort of wide and squat and which will sit fairly well on their bottoms. I went with one big pepper per person, which worked well because the small Bears only wanted half of theirs; the other pepper made a good leftover lunch for the Bear. Slice the tops off each pepper and pull out the seeds and membranes. You will be using the pepper as a cup for the filling, so don't make any other holes or openings in the peppers. Save your sliced-off tops though; you may need them later. Place all your pepper cups into a large pot filled with water to cover the peppers. You are going to par-cook them now. Bring the water to a boil and let the peppers cook in the boiling water for about five minutes. You will be baking the stuffed peppers later but this helps them to become more tender. While the peppers are boiling, you can start preparing your filling. You'll need some cooked rice; I used about a cup, cooked. You could use leftover rice or cook it now. I chose to make instant rice just to do things faster. Continue making the filling. Chop your onion (I used half a large one) and garlic, then saute them in a little olive oil in a large skillet; you'll be adding the rest of the filling ingredients to the onion and garlic, so you want to use one that is large enough to hold everything. Your peppers should be boiling now; they'll bob around in the water quite a bit so add more water if you need to. When the peppers have par-cooked, remove them from the pot to a strainer and run cold water over them for a moment. Then set them aside and continue working on the filling. You can add your meat (or meat substitute) to the onions and garlic now; let the meat brown in the pan until all the pinkness is gone. Break up the meat to ensure small bits for your filling. I used about 12 ounces of ground turkey breast because it's what I happened to have in the freezer. This is one of my modifications; the Betty Crocker recipe used beef and more of it, a full pound. I liked the milder flavor of the turkey and we didn't miss the additional meat. When your meat is cooked, you can stir in your cooked rice and most of your tomato sauce. Reserve about half a cup of sauce for pouring over the peppers before baking. One of my modifications to the Betty Crocker recipe was to use half plain canned tomato sauce and half Ragu mushroom pasta sauce from a jar (it was what I had on hand). A key complaint my family had about stuffed peppers was that they didn't have much flavor, so I thought the mixture of sauces would help boost the flavor and it really did. I put a cup of each type of sauce in a measuring cup and stirred to combine them. Combine the rice and sauce with the meat mixture in the pan and heat through. Take your skillet off the heat and bring it to wherever you're working. Spray a glass baking dish with Pam and begin arranging your peppers in it. I used an 8-inch square dish. You want the peppers to fit securely in the dish so that they don't tip over while baking. Remember your reserved sliced-off pepper tops? They can now be used to help the peppers stand up in the dish. Just insert them between the peppers to help keep them snug. I learned this trick from the "America's Test Kitchen" show. Begin spooning your meat/rice filling evenly into the peppers, leveling the mounds on top if necessary. Pour your remaining sauce evenly over the filling to cover it, then sprinkle the cheese evenly over the sauce. Place your baking dish in the preheated oven and bake the peppers for about 45 minutes. They will be done when the peppers themselves are soft but still holding their shape. I put each pepper on a plate and replaced the sliced-off top. We sliced them into halves at the table. We loved these stuffed peppers! They came out better than ever before. We will definitely be having them again soon. Following Jen at little birdie, here are my four weekly photos of happy. We had our little family party to celebrate the LB's mastery of subtraction at school, as well as finally (mostly) kicking the horrible flu that struck the Thistlebear home last week. Pizza (with mushrooms and black olives, toppings chosen by the LB) and banana splits (with chocolate ice cream, as per the LB's request) were enjoyed by all. It was the first time the GB had ever been served such a big ice cream treat and she was certainly a fan. I bought strawberries during the week, and they made me very happy. I was so excited about them I had to stop in the middle of slicing to take a picture. I changed the garden flag in the courtyard at the front of our house. I have flags for every season and holiday. I've collected them for a long time. I did a thorough grocery shopping this morning and couldn't resist this little pot of daffodils for only $2.99. It just barely fits inside this old glazed flowerpot I keep under the kitchen sink. I can't wait until they bloom. We're having a quiet day. I'm feeling a lot better but not great. There has been rain and a lot of clouds and mist. The mountain is almost completely obscured by clouds. They descend quickly during a storm. Dark, wet days are unusual here but we enjoy them thoroughly, along with the sound of rain on the roof. I went to the store alone yesterday, the first shopping I had done in over a week because of my illness. The Bear had done a little for me while I was very sick. But then he got sick too. I found strawberries for an unusually low price and had to have them. They are what you might expect from strawberries in January but I ate them happily. I'm playing with fabric this afternoon. I have a project in mind for my dining room table. I'm thinking light and bright for spring. The small Bears have been enjoying relatively warm temperatures and more outdoor play. We haven't felt much like playing with them so we've felt thankful for a walled backyard where they can play with moderate supervision. They've enjoyed not wearing their winter coats for now. But they have been warned that coats will be back next week when it gets cold again. Tonight is our Subtraction Mastery/Flu Survival Party. Goodness, have we earned it. Pizzas and ice cream are eagerly awaited and the Bear and I look forward to watching something mindless and silly later on. This flu is no fun at all. I've been taking it easy as much as I can. Light reading, dozing, perusing spring catalogs online - Pottery Barn and Greengate and Cath Kidston and Carter's and The Children's Place; so many ways to decorate home and children. The Bear has taken very good care of me. He has virtually taken over all of my responsibilities while trying to work from home. He is a wonderful man. I appreciate him so much. And I can show my appreciation by taking care of him as he is also showing signs of illness now. I've had trouble keeping food down because I have a very bad cough. So I'm drinking water and tea, trying to eat a little when I can - especially fruit, soup and sherbet (it feels so good on my throat) - and resting as much as possible. Today I'm finally well enough to sit up in my chair for awhile and I'm hoping tomorrow might bring good enough health for crocheting. I miss my hook. My small Bears have been so well-behaved and we had a very proud moment this week when the LB came home from school with happy news. He had gotten 95% on his subtraction mastery test which means he has "passed out" of subtraction and can move onto multiplication in his math lessons. He is a pretty impressive first-grader. My plan for the weekend, should the Bear and I be feeling well enough, is to have a little party for us. It will be a combination Subtraction Mastery and Flu Survival Party. I think we will have pizza. I normally make pizza from scratch but something tells me that isn't the smartest plan right now. So I think we'll get take-and-bake pizza from Papa Murphy's and make banana splits for dessert. Oh yes, I absolutely do celebrate with food. Sometimes I even reward people with it. So there. Now I'm alone at home. The small Bears are at their respective schools and the Bear is at work; he took them to school earlier this morning. I'm going to pick up the children in a couple of hours. I can handle this outing but I'm going to stay at home when we're done. Maybe tomorrow I'll be ready for a little more time in the world. It's quiet and sunny, not nearly as cold right now as it was last week, though that is slated to return. I'm feeling my health begin to return. I'm writing, listening to the "Today" show, watching my rainbow maker throw color and light around the kitchen. I feel fortunate. I hope you do too. I wanted to say hello and welcome to those reading my blog! I have loved the comments I've received, especially since I got sick, and I am so happy to know people are taking the time to read my musings. Thank you for visiting me, I'm so glad to have you. Following on with Jen at little birdie, here are my four photos of happy for the past week. I'm a day late on this because I have been very sick since Sunday afternoon. I think it's the flu. I haven't been to a doctor, just trying to take care of myself at home, and the Bear has been very helpful to me. He has been able to work from home, which has been really nice. One thing which made me happy was snow. We don't get a lot of snow here typically, but it does happen. We had a storm which brought us about two inches of snow during the week and it looked very pretty in the yard. During the snowy day we stayed indoors. I sewed my oilcloth placemats and my small Bears played very nicely together, which is always refreshing. This picture makes me laugh. We don't encourage them to play along gender lines but they usually seem to end up doing that anyway. This was the scene in the living room, Lego for him and baby dolls for her. This picture makes me happy too. My little girl is made of bright colors. She wears her play tutu every day. On Thursday I had about an hour to myself after putting away groceries and cleaning up the kitchen. I celebrated with a big cup of tea and a cinnamon roll. It was really enjoyable. This weekend has been quite easy and relaxing. It's finally warming up a bit here, which has been so much more comfortable. It makes getting out of the house easier too - fewer layers, hats, mittens, gloves and the like to pile onto my small Bears before we can go. The Bear worked Friday unlike last week when he had a day off, so I was alone for the school driving and ballet class. The GB is so happy to be back at ballet after the long holiday break. The class is primarily a "creative movement"-based one, but this half of the year they are beginning to introduce some basic fundamentals of ballet. It's so interesting to watch these tiny girls, all between three and five years old, learn to move their bodies in an artistic way. The GB has always loved to dance. Even before she could walk, she would move her body to music whenever she heard it. We signed her up for ballet both to encourage her love of dance and to help her learn to take directions and join in with a group. It has been very good for her. She is doing well with the instruction and I can already see her becoming confident about her body. Saturday brought a fun event; the small Bears started their music classes again. They both take music classes on Saturday mornings through a local university's department of music. As a community outreach to help bring music to kids they offer low-cost music lessons and music-appreciation classes. We started both children in preschool music classes and now they have progressed; the LB takes a classical guitar class and the GB is now taking a "music and movement" class. They both love going. The LB is surprisingly talented with the guitar; it helps that the Bear has some guitar skills so he can help him at home. But the LB is agreeable about practicing and has made great progress since he started a year ago. On Saturday afternoon I went to the library alone for a little while. I had a few books that had come in from the holds list. I'm still reading And the Dead Shall Rise, the non-fiction legal/crime book I told you about last week. It's a really good book but it's dense so it's a bit of a slog. I am determined to finish it though. I can already feel a few of my smarts coming back since I decided to read something slightly scholarly. The books I picked up from the library are promising. I tend to find books by searching Amazon.com for books I have already read and then looking at the books other people bought when they bought that one, or books that Amazon recommends. Then I go onto my library's website and check to see if they have any of the books; if they do, I'll place a hold. I don't have an e-reader or even a mobile device, so I can't download books. Maybe someday I'll move on to that kind of technology but for now, I'm still enjoying books the old-fashioned way. Frugality plays a role too, of course. Two of the books I got yesterday are novels, The Snow Child by Eowyn Ivey and The Chaperone by Laura Moriarty. Both look excellent to me. And just for fun, I borrowed Rod: the Autobiography. I've always been a fan of his music. I was probably one of the few teenagers in the 90's listening to his album Rod Stewart Unplugged...and Seated but it was one of my favorites! I owned it on cassette and wore it out on my Walkman. I don't know a lot about his personal life though; I remember on that album where he introduced his song "Have I Told You Lately," saying something about how long it had been since he'd first recorded it. He then said "Me wife was only one!" I think he was referring to his then-wife Rachel Hunter, who was a lot younger than he. He seems like a colorful sort to me. Sunday morning finds us all hanging out in the sunny living room together. I'm sitting on the couch with my laptop and the Bears are on the floor doing various things. The GB received a little beginner's needlepoint for Christmas and is just learning how to work it. The LB and his father are working on an electronics project together. The Bear is an engineer; his educational background includes a degree in electrical engineering, though that is not exactly what he does in his career today. Our LB is just like Daddy and thinks and learns the same way he does. He is entranced by all things mathematical and scientific, but he especially loves electronics and anything having to do with electrical circuits and wiring and has from an early age. I was the mom desperately trying to prevent her toddler from sticking things in outlets; he learned to pry the plastic covers off the outlets before he turned two. It was a headache, but at least now he's old enough to learn how to be safe with his pursuits. I've been crocheting, of course. 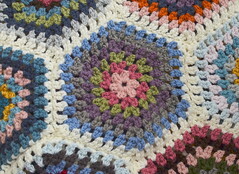 I'm working on the five-round granny squares I showed you last week. I have thirteen finished now, which is less than ten percent of what I'll need to make an afghan, but I truly love working on these squares. I can make one from start to finish, including weaving in the ends, in about thirty minutes. They're fun because I can fit them into any downtime where I have nothing else pressing to do. I'm also enjoying coming up with color combinations, working with a somewhat muted, vintage-esque palette of colors. Sometimes my combinations work really well, like this one, which almost reminds me of a Monet painting. I like this one because it's sort of autumnal. 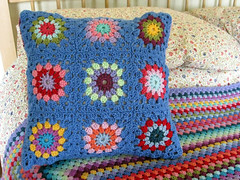 This one looks like it came from a blanket made by someone's actual granny, a very long time ago. And some are less appealing. This one makes me think of Superman. But all in all, they seem to be working well together and I think this will be a cheerful addition to our family room when it's all done. And that's our weekend so far. I have a roast beef planned for dinner tonight and the Bear and I are looking forward to "Downton Abbey" on TV tonight. I am on the edge of my seat wondering what is going to become of poor Edith. I've been sewing this week. I dearly love to sew. 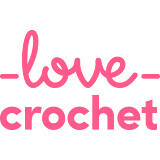 Crochet is wonderful but sewing is my first love. I've been doing it most of my life. As a child, I loved to make little items for my Barbies to wear. I made my first quilt, twin-size, when I was 14. I have had a paying job sewing theatre costumes. Sewing and I go way, way back. Last week I showed you some oilcloth I had ordered from Etsy. I had an idea in mind for new placemats for our kitchen table. The ones we were using were very old and tired but I couldn't find ones like them as replacements. They were the vinyl type with a little bit of batting to make them slightly puffy, not very attractive but useful and easy to care for. Because I couldn't find more, I decided I would make some myself. I opted for oilcloth after falling in love with oilcloth placemats in Jackelope, a local import store which sells the coolest, funkiest home decor items. They had some beautiful oilcloth table linens - placemats, tablecloths, runners and such - which had been imported from Mexico and were just gorgeous, in brightly-colored prints. The only problem was that each placemat cost $12. I wanted at least four of them, but I'm just not okay with paying around $50 for placemats. I like pretty things, but not at any cost. I ended up ordering a yard each of two different prints, one a bright blue ground with red strawberries and blue flowers, and the other a white ground with red dots. This way I could make them reversible, just for variety. I bought my oilcloth for a total cost of $21, including shipping. That felt like a better deal for something meant to catch food spills and which would need to be cleaned daily. Today's oilcloth is cotton fabric with a laminated side; vinyl is used for the lamination. Real oilcloth is made with a heavier fabric, such as canvas, which is coated with oil or wax to make it waterproof. It was once very popular but is difficult to find today. I have read that some people buy it for military reenactment items, such as replica tents. But most of what is sold now as oilcloth is actually made with vinyl. I did some research and learned that oilcloth, like leather, can be "sticky" when sewn on a sewing machine. Most of my reading suggested using a walking foot or a roller foot; some other sources recommended a Teflon foot. I do have a walking foot, but I'm not very experienced with it. I thought it would be nice to have some alternate feet for my machine anyway, so both a roller foot and a Teflon foot were soon winging their way to my home, by way of Amazon.com. They were inexpensive, around $10 apiece. This is a roller foot if you haven't seen one before. There is a tiny, textured steel roller in the foot, which rotates on a pin and helps the foot glide above the fabric you're sewing. Evidently a roller foot is useful not just for leather and vinyl but also for "slippery" fabrics like velvet. So this seems like a good investment; you never know what you might end up sewing someday. I guess you could say that my sewing machine foot collection recently grew by two feet! Ha. On a snowy afternoon this week, I got to work on my placemats. I started by measuring off the placemats' dimensions on the wrong side of my oilcloth. I wanted to make a set of four, so I cut four pieces of each of the two patterns. It's very easy to mark with a pencil and my sewing scissors went right through the oilcloth. My dimensions were 19 inches by 15 inches; this is the approximate size of my old placemats and I think it's a good size. My oilcloth was shipped to me in a postal tube so it was a bit wrinkled; you can see how the edges of the blue pattern are rolled in the above photo. In my reading, I learned that oilcloth can be ironed! But it's a little tricky to get it right because you don't want to melt the vinyl coating on the laminated side. You must use the iron on the wrong side only. Some suggestions include keeping the iron on its lowest heat setting as well as ironing the oilcloth through a tea towel. I tried it with and without the tea towel and found that as long as I worked quickly, the warmth of the iron didn't affect the vinyl coating. While the pieces were still warm, I quickly transferred them to a flat surface where they could cool off without any risk of wrinkling. I cleared a space on my kitchen counter (I do all my sewing and sewing-prep work in my kitchen since I have no separate sewing room - how I wish I did! ), and stacked the pieces as I finished ironing each one. They looked a lot better after the ironing. While they were still warm, they felt a lot softer and more flexible and I started to worry a little bit that I had ruined them but once they cooled they went back to being just as they were before. Next I started preparing them for sewing. I placed two pieces, a white and a blue, wrong sides together for each placemat. You cannot use pins on oilcloth because it isn't "self-healing" like regular fabrics; pinholes would be permanent and because you're sewing this on the right side you need to be careful about damaging it. You can use paperclips, though! This worked great for me. I fetched our tin of paperclips from the Bear's desk and went to work. Before I started sewing I wanted to make sure I didn't need to change the needle in my sewing machine. I had read in a few places that it may be necessary to switch to a larger needle, such as one made for sewing denim or canvas. I decided to take my chances with a regular needle for cotton fabrics and it worked fine when I did some practice stitching on scraps. And yes, the roller foot glided beautifully across the coated fabric. I was ready to start sewing my paper-clipped pieces. I sewed about a half-inch in from the edge and pivoted around the needle in the corners to make them neat. I took the paperclips off as I sewed, removing each one right before the needle came to it. I think they would have broken my needle if I'd sewn over them and unlike pins, they would probably be hard to remove from the seam because of their shape. When the placemats were sewn together, I opted to pink the edges, just outside the seam. I did this because the edges were just slightly uneven and I wanted a neater look. Oilcloth will not fray like regular fabrics but it's also difficult to hem the edges. Pinking makes them tidier and I think it also gives them a slightly scrappy, vintage look. I put them on the table and admired my handiwork. I was really pleased with them! They go beautifully in my strawberry-themed kitchen, which also includes some kitschy/vintage-y items. The white/red dotted side is equally cute and cheerful. I love them! It was a quick little project, taking only about an hour and a half from start to finish. My pinking could use some improvement (my shears are heavy and don't open and close very easily - maybe an oiling is in order), but I'm very happy with the way my placemats turned out. The Bear came home from work that evening and was surprised by them; he hadn't known I would be making them that day. But he likes them too and my small Bears are just thrilled, especially the little girly one, who loves to watch sewing in progress and enjoys the bright colors of her new placemat.